Despite careful medical care helping to ensure the healing of her flash and bone, Wilding’s arm was crippled, dramatically changing her life. Some movement to her upper arm has been restored by nerve implants, but if she wants any greater functionality from this part of her body, it will take rather more drastic measures to achieve it. Having already been told that she would never again be able to use her hand, Wilding’s imagination was fired when she saw a BBC Newsnight film on the work of Austrian surgeon Oskar Aszmann. The end result is that she would now like to have her hand cut off so that she can replace it with a bionic prosthesis. The film showed that Austrian resident Milo had opted for such a measure, elective amputation, with his own withered hand being replaced with a prosthesis. Also featured in the film was the first person to undergo the procedure, Patrick. His display of what he could do with his own bionic hand – including tying his shoelaces and opening bottles – only further increased the sense of urgency in Nicola to get in touch with Mr. Aszmann. When the surgeon visited London to give a lecture on his work to doctors at St Thomas’ Hospital, he and Nicola finally had the chance to meet. An initial consultation took place there, with Aszmann concluding afterwards that Nicola was a good candidate – although he also warned of the irreversibility of the decision of elective amputation. Even after going to Vienna so that thorough tests can be conducted on her, she will have to wait to ensure that she qualifies for the procedure – and then, there’s not only the surgery, but also the lifetime of prosthetic hands and maintenance for which she will need to raise the money. Procedures like that sought by Nicola Wilding, as well as the actual bionic hands already been used by the likes of Jason Koger, are at the center of the expanding role that iOS and iDevices are taking in boosting the mobility and independence of those with a requirement for prosthetics, in the process immeasurably increasing the quality of their lives. These procedures and associated equipment are about something far more fundamental than the gimmickry with which many may associate the iPhone or iPad. A decision as drastic as that set to be made by Nicola Wilding may seem like a great sacrifice, but given her own struggles with the most everyday tasks - telling BBC News of having to use her teeth to open bottles and needing to have meals prepared for her – coupled with those of millions of other amputees across the world, it may not seem so illogical. Some medical and bioethics experts have warned against such a permanent measure as elective amputation, suggesting that the chance remains of an organic solution later being found. However, the elation of the small group of people who have already undergone the procedure at regaining basic hand use is clear to see. With bionic hands like the i-limb being able to pick up objects while still not exerting so much force as to break them, it’s obvious that prosthetics are becoming generally much more advanced. 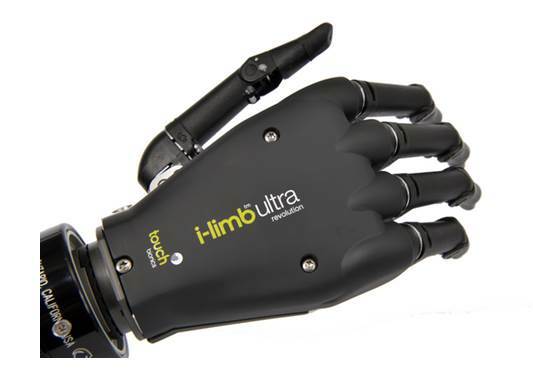 The i-limb ultra’s complete range of features, in fact, includes not only the unique biosim software, but also the likes of a patent-pending vari-grip mode that allows for variable digit-by-digit grip strength, gesture selection that allows for the creation of various custom gestures, three new tripod grips for enhanced user flexibility and an auto grasp feature to prevent objects slipping. Also included in the package is dedicated clinical support for prosphetists and therapists and a two-year standard warranty. The recent Boston Marathon bombing only further highlights how assistance for amputees in their daily lives will become a more relevant issue. 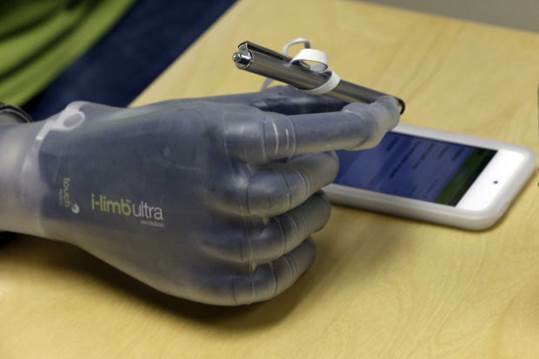 The incorporation of such a now-widespread thing as the iOS app into the wider strategy for amputees is therefore, in many ways, simply a logical next step, making the most of the latest advances in mobile and prosthetic innovation.